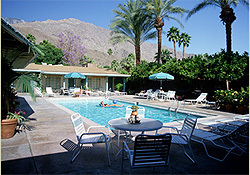 Visit Palm Springs' first lesbian friendly hotel formally known as the Desert Knight and mentioned in the book Palm Springs Babyon as being visited by such guests as Gloria Swanson. 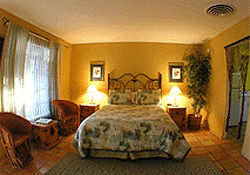 Our beautiful resort has been renovated with designer furnishing and central air conditioning. 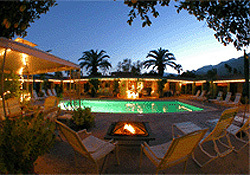 Our heated pool is there for your enjoyment and the striking views of the Santa Rose Mountains are breathtaking. You will be pampered in our appointed queen bedrooms while you relax to the music of your choice from the stereo system in your room. You may cook a romantic dinner in our fully equipped kitchen or walk to some of the finest restaurants and gay nightlife in Palm Springs. 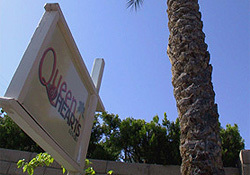 Celebrate that romantic weekend, birthday, anniversary or special event at the Queen of Hearts Resort. Ask about our special weekend packages. Reserve Now!